Predictions are lukewarm for the upcoming holiday season, as the country still works to recover from the economic woes of the past decade. As the biggest shopping weekend of the year rapidly approaches, retailers have already begun preparing to be competitive. But while the prediction of a $630.7 billion season is 3.7 percent above last year’s total, retailers want to know how they can grab a bigger portion of customer shopping dollars. Regardless of current employment rates, customers still feel shaky about the economy. 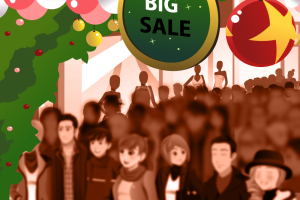 For that reason, this year will likely be another year of customers searching for the best deals, whether on Black Friday, Cyber Monday, or in the important days leading up to Christmas. Here are a couple of things retailers can do to win customers over. When budgets are tight, customers tend to shop for discounts and bargains. Coupon-based promotions have been especially popular during the tough economy, as have early-bird shopping deals and free shipping deals. At one time, customers had to go from store to store to compare prices, but the Internet has given them the ability to compare prices from home, from the car, or while standing in your store. To increase your chances of winning business, offer to beat any competitor’s price. Your customers can buy everything they need in one place and you’ll benefit by having them spend with you, rather than your competitors. In addition to offering to beat others’ prices, make an effort to consistently monitor prices on the products you sell and make sure your own prices are competitive. Convenience wins today’s busy customers, so the more you can do to make your customers’ lives easier, the better. If you operate both online and brick-and-mortar stores, provide your customers with the opportunity to ship items to your store for pickup or to return online purchases to the store. In addition to traditional conveniences, consider creative ways you can make things easier for your busy customers. Would free gift wrapping appeal to your customers? What about a “buy now, pay later” offer like Walmart’s popular holiday layaway program? You know your own customers best and can likely come up with offers they’ll appreciate. Pricing and convenience will be key elements this holiday season. When brands make it easy for customers to shop and offer the lowest prices, they’ll be sure to win that sales. Through the use of price tracking software like Price Manager, retailers can watch market rates and price their products to stay competitive this holiday season.